DETAILS I envisioned a family Memorial or Fourth of July Day parade through the neighborhood with some of the participants shaking patriotic pom poms while others played home made musical instruments. I haven't put that together yet, but I'm thinking about it, starting with the pom poms. Actually, you don't need a parade for these to be a fun project. 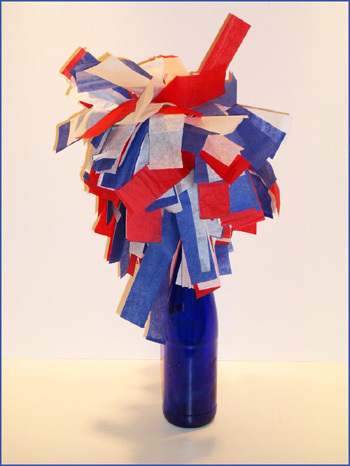 You can practice cheerleading or as we photographed the pom pom in the blue bottle, I thought three of these would look very festive on my fourth of July table and my wonderful children would enjoy making them. Begin by placing three sheets of tissue paper together - if you want to be patriotic use red, white and blue. Fold in half lengthwise. Cut one inch strips from the open end to within an inch of the fold. DO NOT CUT THROUGH THE FOLD. Starting at one end, roll the folded edge around the end of the popsicle stick leaving enough of the stick showing for gripping. When you've rolled the tissue to the end, TAPE THE POM POM to the stick. Repeat the process three more times. Tape the three sticks together when you've finished.